"We first had the idea for this method when we wanted to be able to visualize changes in the cytoskeleton arrangement due to applied forces on cells," said paper-author Dr. Delphine Dean. She said other researchers have been using this method to print cells onto slides, but that they have only recently discovered that printing the cells causes the disruption in their membranes for a few hours. Creating temporary pores allow researchers to put molecules inside of cells that wouldn't otherwise fit, and study how the cells react. "The authors have used an extremely innovative approach for bioprinting cells. 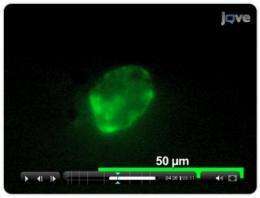 Moreover, this approach can be used for applications other than cell printing," said JoVE Science Editor, Dr. Nandita Singh. "Matrix proteins can be printed onto substrates with this technique for cell patterning. This JoVE publication will make this approach simple and approachable and enable other labs to replicate the procedure." The printer is modified by removing the paperfeed mechanism and adding a "stage" from which to feed the slides. The ink is replaced with a cell solution, and the cells are printed directly on to the slides. Using this method, the researchers are able to process thousands of cells in a matter of minutes. Dr. Dean's team used the holes to introduce fluorescent molecules that illuminate the skeleton of the cell. "We are actually interested in the cell mechanics of compressed cells. This method allows us to push on the cells and watch the response easily," said Dr. Dean. "We are interested in cardiovascular cells, and how they respond to mechanical force." Dr. Dean chose to submit her method to JoVE, the only peer reviewed, PubMed-indexed science journal to publish all of its content in both text and video format, because, according to her, "until you've seen it done, it's hard to understand the process."